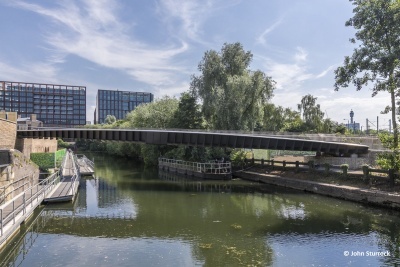 Designed for cyclists and pedestrians to cross from Camley Street into King’s Cross Central, a landmark redevelopment project, the bridge spans 38m, weighs 52 tonnes and is only 1100mm deep at mid-span and 400mm deep at the ends. In keeping with the Victorian heritage of the area, the bridge is unadorned and streamlined, focusing attention on extremely detailed and precise craftsmanship and high-quality materials. A sweeping ramp leads up to this almost impossibly slender steel bridge. Designed for pedestrians and cyclists, the bridge improves access into King’s Cross Central, a landmark redevelopment project. The simplicity of its unadorned and streamlined form, focuses attention onto the bridge’s high‐quality materials and precise craftsmanship.